Xanadu Two is a magical Beach Mansion of 5,500 square feet with its own private pool situated on the Palm Jumeirah (the unique man-made island built in the shape of a date palm tree) which is home to some of the world’s most sought after luxury villas. Guests can enjoy unique private beachfront living in beautiful surroundings with stunning water views. The villa is 30 minutes from Dubai International airport. 50 minutes from Abu Dhabi Airport. 15 minutes from City Centre. 15 minutes from Mall of the Emirates & Ski Dubai. 15 minutes from Emirates Golf Club. Bookings may be made for any period from one night. The villa comprises 5 bedrooms in total. 4 double bedrooms & 1 twin bedrooms, all with en-suite facilities and built in wardrobes. XANADUBAI is Licensed by Dubai Tourism. BABY cot, car seat and high chair are available on request. WORKSTATION: A fully equipped Laptop with WI-FI, webcam and All-in-One Colour Printer/Scanner/Copier is available for guest use free of charge. Landline (with International Direct Dialing), and Fax facility are also available at additional cost. Local calls are free of charge. BATHROOMS: There are six bathrooms in this villa. All 5 bedrooms have en-suite bathrooms and there is one additional powder room in the Lobby area. Towels, bathroom accessories and hairdryers are provided. LAUNDRY: A washing machine and dryer is available along with steam iron and ironing board. HOUSEKEEPING SERVICE: A served breakfast & evening turn down service is provided by the housekeeper on a daily basis. Bath towels are changed twice weekly, beach towels daily. AIR CONDITIONING: The Villa is fully air-conditioned with all rooms having independent controls. TRANSPORTATION: One arrival and one departure airport transfer (from and to DXB or DWC) is provided by our driver FREE of charge. The car accommodates a maximum of 7 passengers. 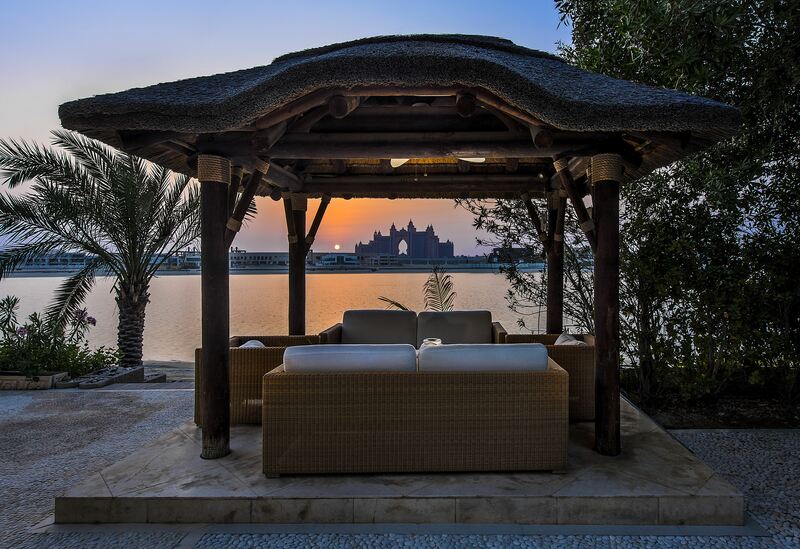 Many VIP’s live on the Palm Jumeirah so Nakheel Security ensure that only legitimate guests or visitors with prior approval (by submitting IDs in advance) are entitled to access these particular areas. This guarantees your privacy like nowhere else!